Upper Aboyo Passage is a deepwater sea in Weta State in northeast Irukandji. The Aboyo River passes through Upper Aboyo Passage before reaching its northern terminus at Weta Island. Featuring underwater canyons and a crescent shaped landmass at its centre, Upper Aboyo Passage was a popular region throughout its entire life. 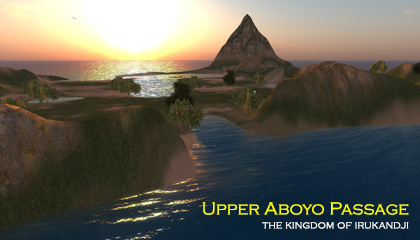 Like other regions in the kingdom's east, the name Upper Aboyo Passage is deliciously facetitious, which met with many childish giggles from tenants and visitors over the years. Upper Aboyo Passage began its life as a small-scale holiday resort similar to nearby Tongabuti Bay, and both were quite popular throughout 2007. In 2008, I removed the holiday cabins and offered the central island for sale. It sold the same day to a Belgian tenant who rebuilt the Marseille palace there in remarkable detail. While outwardly, someone could say that there is much to typify Upper Aboyo Passage with other scenic regions of the day, there's actually a reason for that being true. Essentially, Upper Aboyo Passage was where this style began. 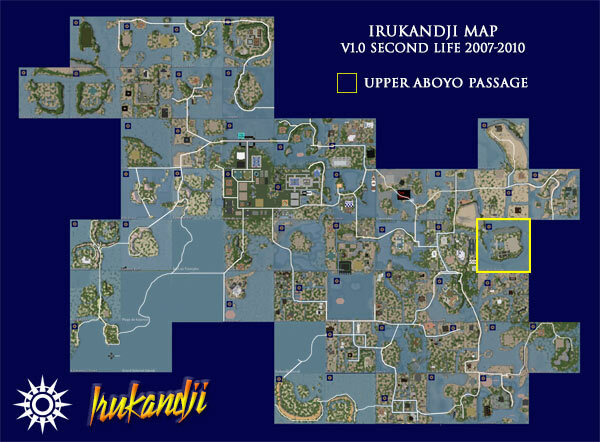 Its layout was so popular that it created demand for more like it across all of Irukandji. In the years that followed, around 30 new regions including Sulawesi Bay and Whitsunday Island, would draw from the Upper Aboyo Passage template, and they would prove popular as well. Regions bordering Upper Aboyo Passage, are Cabria Island, Minoan Atolls, Grand Irukandji, Tongabuti Bay, Weta Island, and Weta Rim. Below are a few extra photographs that survive of Upper Aboyo Passage.